LONDON KY—The London Laurel Co. D.A.R.E. Program is hosting their 2017 Golf Scramble Fundraising event on Saturday, May 13th, at the Crooked Creek Golf Course. Funds raised benefit two Laurel County teens through the Don Wattenbarger D.A.R.E. Scholarship Fund. The scramble will be played through four-person teams and check-in/registration begins at 8 a.m. with light refreshments provided, and Tee Time is at 9 a.m. Skirts and mulligans are available for purchase. Entrance fees are $50 per-player or $200 per-team, with lunch provided. Guests are welcome and individuals will be paired with other players. Prizes include 1st-3rd place prizes, a longest drive prize, a closest to the pin prize, a hole-in-one prize, and door prizes. Over the past six years, the London-Laurel Co. D.A.R.E. Board has provided a dozen Laurel County teens with financial assistance to the college of their choice to help make their future dreams come true. The Don Wattenbarger Scholarship Fund awards $1,000 to two Laurel County high school seniors. D.A.R.E.’s objective is to teach all students good decision-making skills to lead safe, healthy lives free from violence, substance abuse, and other dangerous behaviors. The London Police Department has been spearheading the local D.A.R.E. program since the early 1980s. 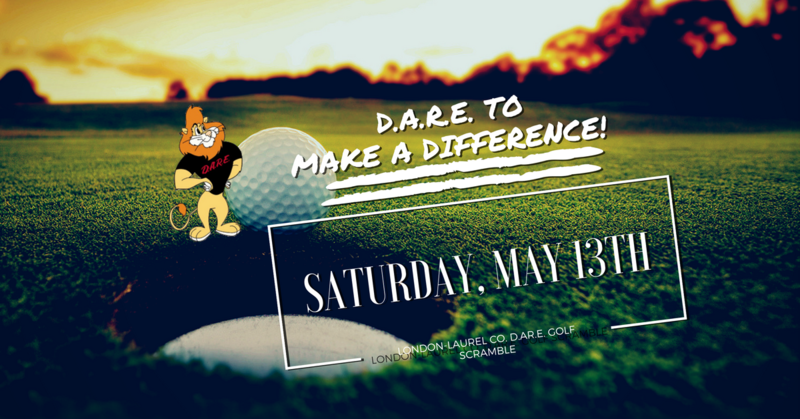 To pre-register for the scramble or for more information call the London Police Department at (606) 878-7004 and ask for Magen, For more information visit http://www.londonpd.com/daretogolf/.